Experience the best. For intensive workloads on PCs and workstations, the 970 PRO delivers ultimate performance powered by Samsung’s NVMe SSD leadership. The latest V-NAND technology and new Phoenix controller in a compact M.2 (2280) form factor meets the needs of the most demanding tech enthusiasts and professionals. Performance that puts you in command. 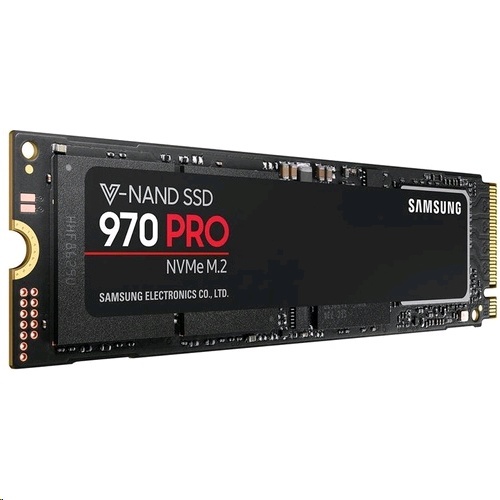 The 970 PRO combines the next-gen PCIe Gen 3×4 NVMe interface with the latest V-NAND technology and a newly enhanced Phoenix controller to achieve fearless read/write speeds up to 3,500/2,700 MB/s1 , approximately 30 percent faster than the previous generation. Get the ultimate sustainable performance. The 970 PRO delivers up to 1,200 TBW2 with a 5-year limited warranty, achieving 50 percent greater endurance than the previous generation, all powered by the latest V-NAND technology. Achieve a new level of drive confidence. Samsung’s advanced nickel-coated controller and heat spreader on the 970 PRO enable superior heat dissipation. The Dynamic Thermal Guard automatically monitors and maintains optimal operating temperatures to minimize performance drops.